Clayman is the fifth album by Swedish metal band In Flames. The album was released by Nuclear Blast on July 25, 2000. Most of the lyrics deal with depression and internal struggles. The album's cover art is based on Leonardo da Vinci's Vitruvian Man drawing. The Jester Head appears in the background, both on the cover, and in the album booklet itself. Music videos were made for "Pinball Map" (directed by Tamara Jordan) and "Only for the Weak". In 2005, Clayman was ranked No. 448 in Rock Hard magazine's book The 500 Greatest Rock & Metal Albums of All Time. All lyrics written by Anders Fridén; all music composed by Jesper Strömblad and Björn Gelotte. Christopher Amott (formerly of Arch Enemy) – guitar solo on "Suburban Me"
^ Palmerston, Sean. "In Flames - Clayman". Exclaim!. Retrieved 2019-02-08. 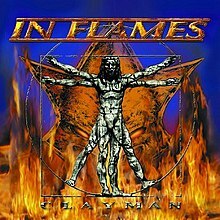 ^ "Clayman - In Flames". AllMusic. Retrieved July 11, 2014. ^ Albrecht, Frank. "RockHard: Review anzeigen" (in German) (158). Rock Hard. Retrieved May 22, 2013. ^ Rensen, Michael; Kühnemund, Götz (2005). Best of Rock & Metal die 500 stärksten Scheiben aller Zeiten. Königswinter: Heel. p. 30. ISBN 3-89880-517-4.